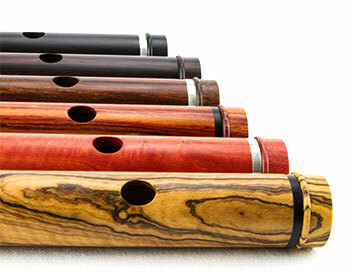 Our flutes are made of dense tropical woods, selected for their tone quality, integrity and beauty. We do not use endangered species of wood. We use primarily African Olive, Grenadilla and Mopane, but flutes in Kingwood, Pink Ivory wood, Tulipwood or Verawood can be specially ordered, if we have seasoned billets in stock. In our shop, boxwood is mainly used for detailing and restoration. We store the wood in a controlled environment for three or more years, to season and stabilize the billets, before they are gun-drilled and cut into flute blanks. Then, to prepare it for the real world, each blank lives through a year in ambient conditions while it is made into a flute. Grenadilla is the favourite of the traditional player, but we also recommend Mopane and African Olive, not just for their tone quality and appearance but also for their hypoallergenic attributes. 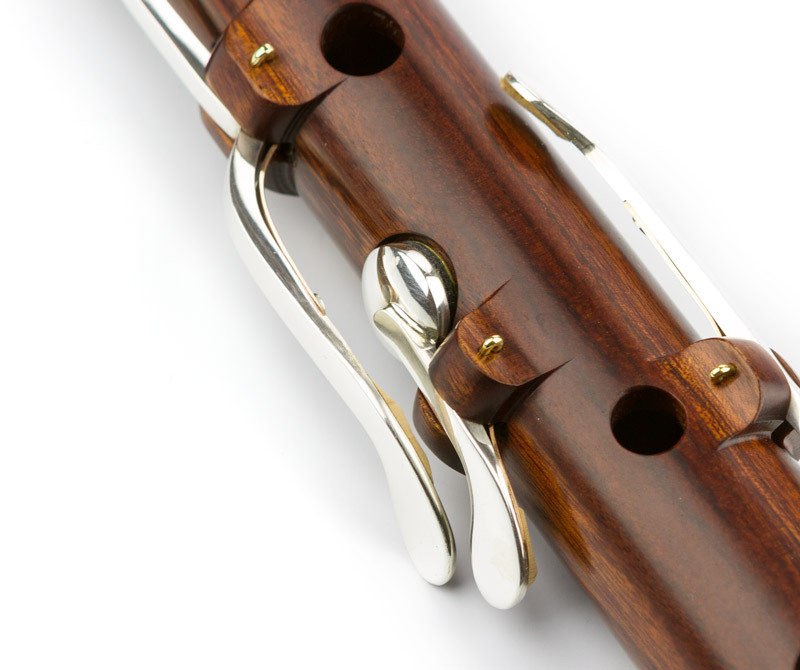 Mopane and African Olive woods compete well with African Blackwood in sound quality, and sometimes demonstrate a richer tone, once the flute is well played-in. There are several tropical hardwoods like cocus and cocobolo that we do not stock despite their recognized use for wind instruments, because they are commonly the cause of allergy. We import our the African tonewoods directly from a certified wood cutter in South Africa, who offers a consistently reliable music grade timber. Non-African tropical hardwoods like Kingwood, Tulipwood and Verawood, we obtain from suppliers in the US and Canada. For a given application, we seek the best available material, and keep an open mind to its performance and to alternative product options. For example, we test the epoxies for flexion, strength and endurance, and we analyze pure hardening oils for in-depth wood protection, speed of hardening, surface sheen and the ability to preserve and enhance the natural colour of the wood. The keys are sterling silver. The rings are made of sterling silver, contrasting flute wood reinforced with carbon fibre, or bronze which is lighter and stronger than silver. To care for the flute and properly maintain the bore, cork and tuning-slide, we recommend the products of Alisyn Lubricants. We make Windward’s own windings wax to hold the waxed silk thread on our tenon windings.